Maine GOP perhaps naively thinks that things should be quiet this weekend. I mean, they’re only having a state convention that will finalize their delegate selection. No biggie. What could possibly complicate matters? The Maine GOP is going to have some star power at its state convention this weekend. Conservative radio talk show host Howie Carr will be broadcasting live, and Ben Carson will deliver the keynote address. But organizers hope the excitement ends there; they’re not looking for controversy. …(yes, it exists) is coming to a realization: this go-round, they matter. They have 19 delegates! There are candidates who want those 19 delegates! People are going to come up to them and say, “When are you posting your results?” with, hey, real interest in their voices! I’m not even mocking them for it. The rest of this campaign season may be an endless carnival of destruction, pain, and personal vendettas – but the smaller state/district/territorial parties must be having the time of their lives. Shoot, I should probably go over early Saturday and score an interview with these guys. Why not? It’s news. Quote of the day, We Must Simply Accept That The GOP Is In Better Shape Than Democrats edition. …much of the national media focuses on a fractured-party narrative for Republicans, who arguably are less divided [than Democrats] but appear to be so on the surface because they have more candidates — and because of the media’s obsession with Donald Trump, who has failed on numerous occasions to espouse traditional Republican tenets. More candidates does not mean there are more factions of a party; it means there are (or were, until Iowa) 12 people who felt the call to run for president. Basically, Salena Zito is pointing out one of the paradoxes of this campaign. The GOP seems to be more fractured than the Democrats, but in reality our candidates mostly know what the party is generally for, and are generally lined up for it (even Donald Trump knows the absolute basics* that he’s not allowed to transcend). The Democrats, on the other hand? …Well, they’ve got two candidates trying to outdo the each other when it comes to impressing maybe thirty percent of their party, and never mind the other seventy percent who just remember that nice Truman fellow and would prefer more like him, please. Our problems stop once we get a candidate. The Democrats’ problems will only have just begun. *One thing: I don’t really believe that Donald Trump is a small-government sort or really pro-life or particularly pro-gun or hesitant to get involved in blatant social engineering. But I do think that the man genuinely loves the United States of America. And that he would not hesitate to [expletive deleted] up the [expletive deleted] of anybody who [expletive deleted] with us. Tweet of the Day, The GOP/DEM Debate Strategy In One Nutshell edition. For the record? I prefer the Republican strategy. No reason to hide from the voters. They don’t bite. The Undercard #GOPDebate is going well. Good questions and at least two smart debate participants. Check it out; watch it here. CNBC Dumpster Fire Debate brings in 14 million viewers. Iowa and New Hampshire GOPs starting to notice that they are not universally beloved. I wonder how many people outside of Iowa and New Hampshire are upset by this? I imagine, not that many: ” For nearly a half century, Iowa and New Hampshire have played a pivotal role in American electoral politics. But their top place on the nominating calendar is under threat like never before.” Certainly Republicans outside of those two states are going to default to not-caring at best. Interesting analysis on the GOP’s relative strength right now. GOP easily counters Barack Obama’s unconvincing, pro-forma rhetoric on tax hikes. I said on Twitter the other day that Barack Obama’s new tax hike proposals weren’t designed to pass, or even embarrass the Right (they won’t): he made them in order to keep the Left off of his back. Alas, nobody noticed or cared enough to push back; but if somebody had done so I would have noted that ‘higher taxes’ is the Democrats’ great white whale. They always chase it, obsess over it really – and never seem to notice that everybody else looks at them funny over it. And it’s not exactly difficult to counter the rhetoric. Case in point: from a Hill article on the GOP response to the aforementioned tax hikes. “It’s not surprising to see the president call for tax hikes, but now he’s asking Congress to reverse bipartisan tax relief that he signed into law,” said Don Stewart, deputy chief of staff to Senate Majority Leader Mitch McConnell (R-Ky.). So, it’s August, and it’s GOP +7 in the Senate. 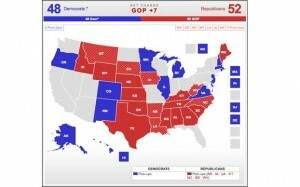 Via Stephen Green: oh, how I love this RCP Senate average map.